Today was a busy day full of good food and great people. Once I get all the photos and my thoughts together, I will definitely share. I woke up at 5:50am, worked out, cut Max's hair for his day of being in front of the camera, got everyone showered and fed...and we were out the door. Since it was a day out, I decided on an easy dinner tonight. It was raining this afternoon and since it was a busy day, we all wanted something hot for dinner. So, it was a pasta bake for the boys and a quinoa bake for me! I used to love eating pasta, but I think I ate too much of it and am now kind of over it. I LOVE quinoa! It works so well like this too, plus I get a great dose of protein! This bowl was loaded with cooked quinoa, peppers, onions, cauliflower, pasta sauce and covered in Daiya. After I mixed it all together and topped it, I broiled it to melt up the cheesy topping. Perfect! Now, I am off to watch the illustrator's chosen movie about something post apocalyptic...should be really uplifting (note sarcasm). Don't get me wrong, I love post apocalyptic, just not in the mood tonight. Let's just say I could use something a little more "fun". Oh, and if you are in to art or do anything in a creative field, he wrote a great post today about style. I can totally relate to it with food and cooking styles too. 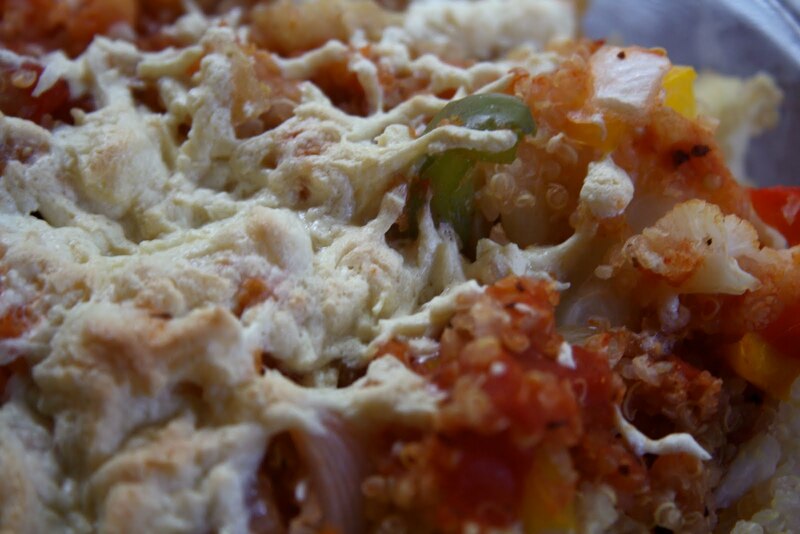 Your quinoa pizza bake sounds wonderful!! OOOOoooo what a great idea! I bet my little guy would love it! Have you ever tried any of the Quinoa pasta that is on the market? Jessica, I have to find a way to sneak it in on my guys so I can lure them into loving it like I do! Emily, Thank you! You guys have a great weekend! Colleen, yes, we have tried it and love it. It is, in our opinion, the best gluten free pasta out there! Oh that sounds delish. I love quinoa too but my hubby doesn't seem to like it quite the same. Not sure what that's about. Don't you just love melted Daiya??? And thanks for sharing how you and your hubs met. Too funny. Take care and have a great Saturday! Haha, I totally understand your not feeling the post-apocalyptic movie. Some nights you just want to laugh, not think or watch things blow up. On a different note, that quinoa bake looks delicious! I have a huge box of quinoa and have been looking for different things to do with it. This will definitely be added to the list! I love quinoa and EVERYTHING Italian, so this looks right up my alley! I've been trying to get my husband to eat healthier lately, so this seems like something he'd enjoy, too! I can't get over your layout! It's gorgeous! I've never tried quinoa but I'm dying to try it now! I've never gotten into quinoa but anything pizza-themed stops me in my tracks. If anything could make me try quinoa, it is this! 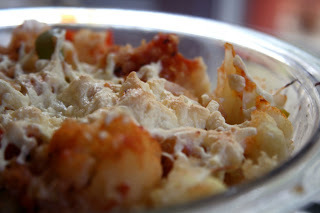 Pasta bakes are so delicious--I remember when I made one for my roomies at school. They gobbled it up! I still haven't tried Daiya cheese yet. Yum! I love anything with marinara, I bet I'd like this too. Although I've yet to do the fake cheese thing. Mmm I used your idea for my dinner tonight, threw in a bunch of stuff from the fridge and it was awesome!!! Thank you for the idea!! I love it! I love the idea of using quinoa instead of noodles! And anything topped with Daiya makes it better. continuez sur ce modele ! First Day Of School 2010!